My map of the world of the Mabinogi shows the Welsh and English names, and spans from Iwerdun (Ireland) to Llundain (London). PIC IS BIGGER than shown here – rightclick and save! COPYRIGHT remains mine as Shan Morgain, but you are free to rightclick and download for personal use, or teaching, providing the map is unchanged. For publication, please contact me. >My thanks to John Davies, the sailor, for help locating Gwales (Grassholm) island; and for patient help with the Welsh names from Christine James, my supervisor. Any mistakes are still my responsibility. Notes about the places in the map. The boundary between Wales and England is the modern one. In the mediaeval period this fluctuated a good deal, changing according to the fortunes of war and colonisation. 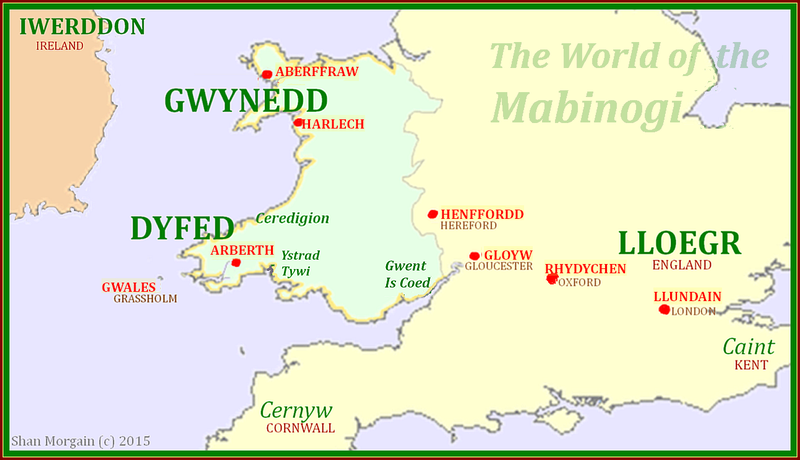 The First Branch of the Mabinogi presents Gwent as definitely a Welsh lordship: it was by the later 11thC under English, then Norman invasion.The Third Branch of the Mabinogi locates Henfford (Hereford) on the English side. The First Branch opens at Arberth in DYFED, shown here at modern Narberth. An alternative location is northerly, near Ceredigion. Here Pwyll sets off to hnt, and later meets Rhiannon. GWENT where Pryderi grows up, is about 100 miles away from Arberth, five days to a week’s travel. Pryderi marries Cigfa of Gloyw (Gloucester) in border country. He adds the territories of Seisyllwch to DYFED (made up of Ystrad Tywi and Ceredigion both frequently contested territories). Annwfn is an anomalous location, possibly outside physical geography, so not shown. The Second Branch has a Brythonic/ British king holding court at Harlech with its great rock, in GWYNEDD; ruling all Ynys Pydain, Britain. Branwen’s wedding is held at Aberffraw. The British sail west to war in IWERDDON (Ireland). Pryderi, Manawydan and other war Survivors return, to sojourn in Harlech, then Gwales off the DYFED coast. Cernyw (Cornwall) is visible from Gwales’ enchanted hall. Finally the Survivors take Bendigeidfran’s Head to Llundein. The Third Branch is mainly set in DYFED. It mentions the usurper king Caswallawn in Caint (Kent). Pryderi visits him at Oxford. The Dyfed royals live at Arberth then go east to Henfford (Hereford), then returning to Arberth. The Fourth Branch moves from the northern borders of DYFED (Ceredigion, Seisyllwch) to GWYNEDD.